Spotted in a Metro supermarket on north coast of Canada's Gaspe Peniinsula: fresh vegetables, finely chopped as a prepared mix for soup. A simple idea but - while some reader may correct me - one my wife and I couldn't recall being implemented by UK supermarkets. 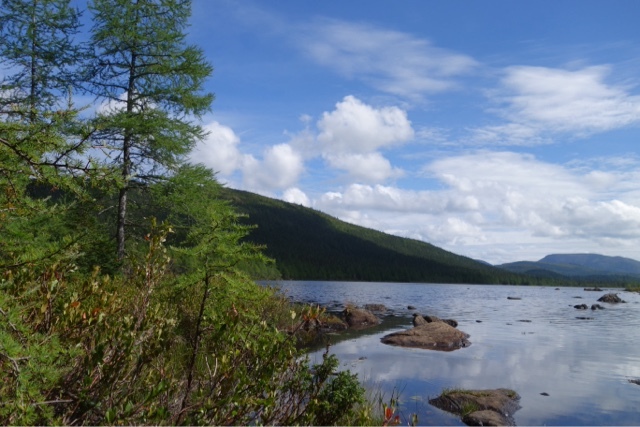 We bought a pack, adding them to stock from the carcase of chicken we had purchased earlier and kept in the fridge at our cabin, to use for sandwiches on our hikes in the magnificent Gapesie National Park pictured above). The cabin was separate from but operated as part of the Gite du Mont Albert, which provides the park's only accommodation other than campsites. The resulting soup, welcome after a wet and windy walk in search of sady elusive moose, was delicious. Lazy? If you like - but we had expended a fair amount of energy on the trail.